Taken on April 11, 2011 under arena lights in unseasonably warm weather at 1/500 sec, f2.8 as Wizard frolicked and showed off his physique. 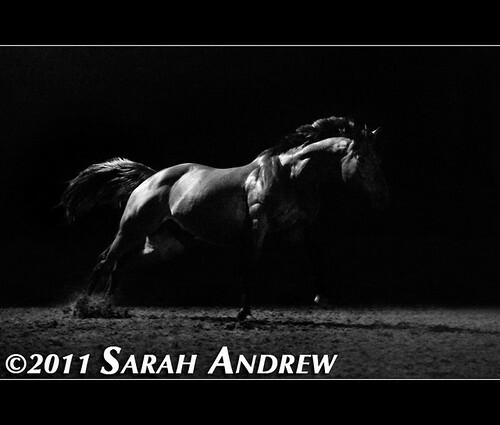 I’ve been experimenting with the arena lights and hoping for this image for a few weeks now, and last night he ran under the perfect patch of light, muscles rippling and neck arched. Some photos require a team of helpers and some are simply a dance between photographer and subject. That’s awesome that you’re putting up your camera settings! Matt and I had a long discussion about how you got this shot and where you were. We’re such photo geeks… LOL! Looking forward to seeing you at Rolex and the Derby this year! I’m flattered! Always glad to talk shop with my fellow photo geeks, LOL. This is beautiful. I love reading about your rides but I come specifically to see what you’ve captured on your camera.